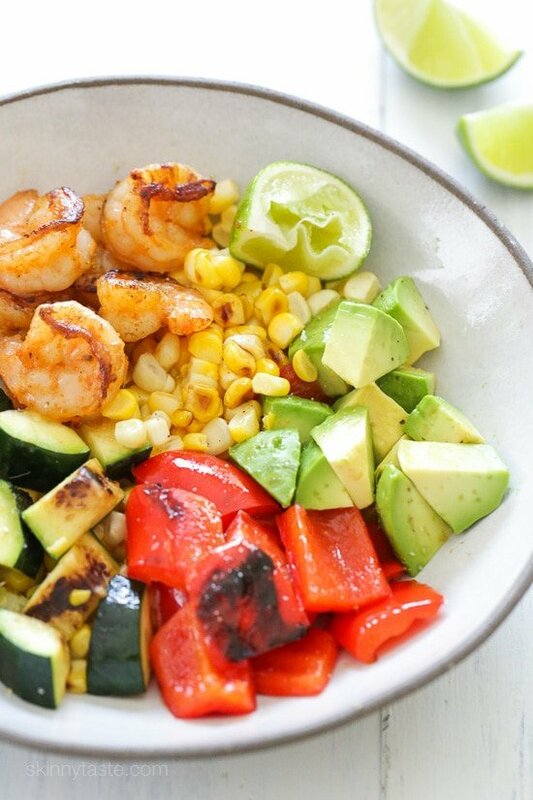 Grilled shrimp, corn, peppers and zucchini topped with fresh avocado and lime juice – an easy light salad you’ll want to make all summer long. Gently pat shrimp dry with a paper towel and place them in a medium bowl. Add the olive oil and toss to evenly coat. Add the onion powder, garlic powder, smoked paprika, brown sugar, ½ teaspoon salt, pepper and cayenne. 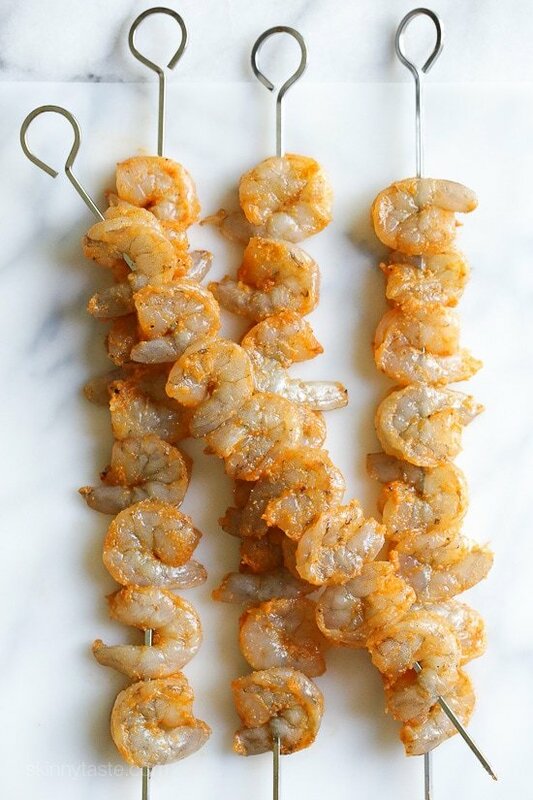 Toss again and carefully skewer shrimp onto pre-soaked wood or metal skewers. Set aside. Lightly spray the bell pepper, zucchini and corn with olive oil spray and use your hands to evenly coat. Season with 1/4 tsp salt and pepper. 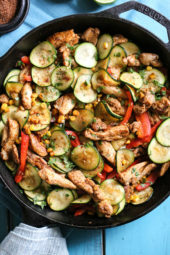 Over medium-high heat, grill the corn cobs, bell pepper halves and zucchini for 4 minutes. 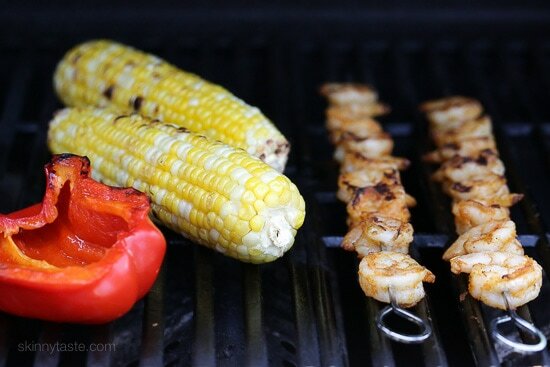 Using long metal tongs, carefully turn the corn cobs, peppers and zucchini then place the shrimp on the grill. Cook for an additional 4 minutes, flipping the shrimp after 2 minutes. Remove everything from the grill at the same time. 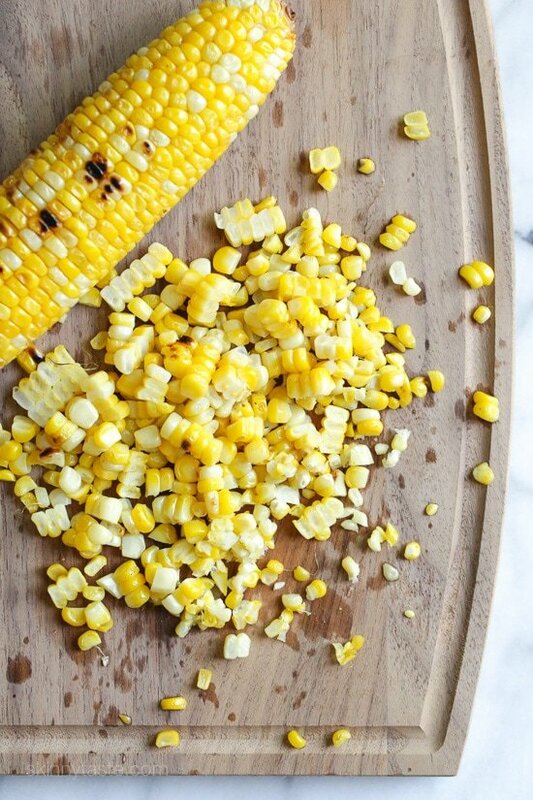 Place corn cobs on a cutting board and carefully cut off the kernels from the cob. Dice the peppers and zucchini. Place the kernels in a medium bowl with the peppers, zucchini, avocado and lime juice. Add ¼ teaspoon salt and pepper, to taste. Toss to evenly coat. Divide shrimp and salad among 4 plates and serve. Fantastic!!! I made this for my family and everyone loved it, which says a lot since my 9 year old is an extremely picky eater. They only thing I did was omit the pepper for him. This has become a staple recipe in our home. Great recipe Gina, thank you! Just made it tonight and it was a huge hit! Doubled the recipe(because teenagers) and made this last night. It was a big hit! Everyone loved it. Some of the 18 yr old’s friends even showed up to try it. – good thing I had a little extra. ? This recipe is amazing! I added more veggies and 1/2 cup cooked rice. Fanta did filling! All recipes this week have been amazing. So filling and flavor. Shrimp recipe is easy and very good. Very good, but very light. Next time I would add something to it. Is this a meal I can make and refrigerate for weekly packed lunches? How long does it keep? My hubby is not a fan of shrimp at all….would you be able to substitute chicken for the shrimp and still marinate/season the same? Thanks! The grill pan has ridges and cooks similar to a grill, I highly recommend getting one! I am making this now and just realized I don’t have brown sugar. Does anyone know if I could use regular sugar as substitute? How much? Thanks! Hey, Gina…I have been following you for quite awhile. I got married in March and wasn’t much of a cook, so I started making your recipes to try on my new Hubs, and he now thinks I’m a GREAT cook! 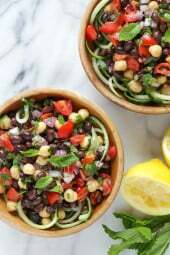 We wanted to start eating healthier, and your recipes are not only yummy, but also good FOR us! I’ve made a few of your shrimp dishes, in fact, I made the pineapple shrimp boat with rice dish last night. My question is…I try to get wild-caught shrimp, raw, and devein it myself, but this task is so time consuming and keeps me from wanting to use it more often. Is there an easier way to use shrimp, without getting the farm raised/cooked version? Also, does the indoor grill work with an electric glass stove top? Thank you for making me look good, and I sure enjoy your daily Emails, and FB posts. Made this today, July 18, 2017. This recipe was so easy and even better tasting. Thanks, this is definitely a keeper. 20g of fat seems to be a typo. Do you know what the actual amount is? Thanks! Wow Gina! This was delicious. I wasn’t expecting so much flavor because it is a simple recipe. 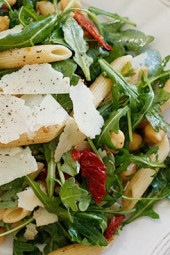 Simple, quick, easy and so delicious….I will be making this often this summer. I ended up using a grill pan (too hot here to grill); I served it over rice…..love it! Do you happen to know what the smart points would be for everything except the avocado?! I am severely allergic to avocado, unfortunately! Thanks in advance! I would delete 1 SP. Is the shrimp raw or cooked type? I’ve made this twice and LOVE it! Followed the recipe exactly and served it with rice. Delish! Made this tonight over brown rice. It was great! Shrimp had a lot of wonderful favors. Used corn from Trader Joes. Added mango. Didn’t use the onion powder just shredded onion on a grader to finely mince. 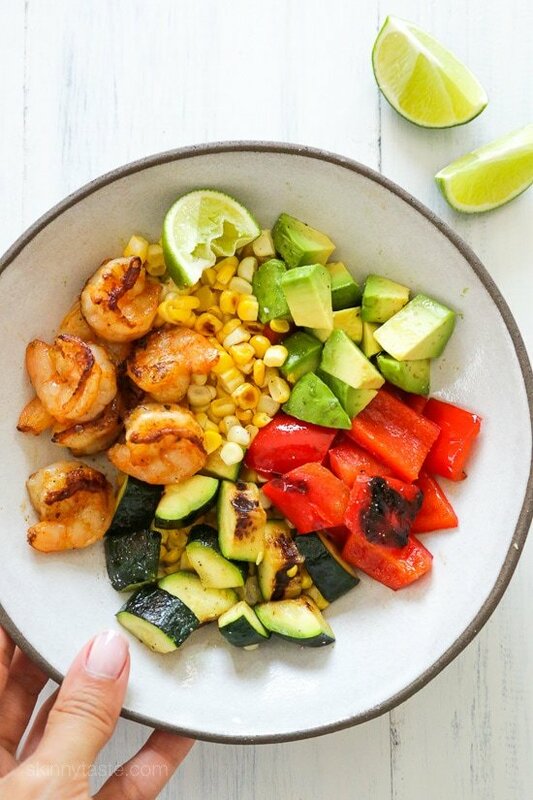 Can you use frozen cooked shrimp for this recipe or does it have to be raw shrimp? Could the shrimp be baked? This has all of my husband’s favorite ingredients! I will try this week. I’ve baked corn on cob in oven with similar spices it was delicious! Can defrosted frozen shrimp be used? This was the most amazing meal I’ve cooked in a long time. It was so fresh, tasty and healthy! A perfect meal for summer. My 4 year old now loves shrimp! This was dinner tonight and it was delicious! Thank you. Is there a way to cook this on the stove or in the oven? My boyfriend, who isn’t impressed by much food-wise, (you’ll get an “It’s edible” from him if you’re lucky) fell IN LOVE with this spice blend!!!!! He wished even more of it had been used on the shrimp!!! We will DEFINITELY make this again!!! This was amazing 🙂 Great flavors with the shrimp! Just made it for dinner and my husband and I were so happy with it! So good! Eating it right now for lunch! Its good cold too! Tonight was my 3rd time making this dish since it was posted. I think it’s better every time. Amazing! I only have a small George Forman, so while I was grilling the shrimp and veggies (added onion), I broiled the corn. Had never done that before and was nervous but I kept turning it and it turned out a little browned and perfect. How can I print a printer friendly version of a recipe? Did you press the black print recipe button? Just made this. It’s wonderful! I made this as a lunch for my hubby and I last week, I was now asked to double the shrimp and make it for dinner tonight!! I can’t get over how much flavor the shrimp had after sitting for just a short time with the seasoning..,this time I’m marinading it all afternoon. So yummy!!! Thank you for an AH-MAZING recipe! My kids (teenagers and college) and their friends love this dish so much they race each other back for 2nds and 3rds (I triple the recipe) and then they immediately mourn the fact that it is over and just how good it was while it lasted. The last time I made it was at a lake after a day spent on water, it hit the spot! FYI- I believe you meant ears of corn, not cobs. The cob is what is left after the kernels are removed. What if you don’t have a grill? How would you cook the shrimp? I’m trying this recipe right now on my stove. I am going to sautee the shrimp in a little bit of olive oil and lightly cook the zucchini and red pepper and also steam the corn. Made this tonight…had asparagus from the farmer’s market in the fridge, so I added that to the mix. Deliicious and very filling and so easy to make. Another home run, Gina. Thank you. DELISH!! And it was super fast on the grill….. love the flavors! I subbed chicken for the shrimp and cooked just a bit longer and it turned out amazing. Israeli couscous on the side for my hungry boys. Gina, we ALL LOVED IT! This is delicious! Might add a cup of brown rice next time, not enough for a meal for me, but so yummy! I made this last night and it was AMAZING! My husband said (and I quote) “This is one of the best things you have ever made” and I cook a lot! I make it on my indoor grill because we do not have an outdoor grill and it was still delicious and had that grill taste! So yummy! Thanks Gina! I love this recipe so much! What kind of indoor grill, stove top, gas? I made this lasts night and it was awesome. It was perfect for a week night dinner. I might even double it for a Father’s Day cookout. This is going into the rotation. Thanks for sharing. Can the shrimp be marinated overnight or all day or is that bad for shrimp? I just try to do as much prep before work or the night before. Thanks! Loved this!! I substituted asparagus for the summer squash and it was delicious! Big hit in my house. This was amazing! Love the shrimp flavoring! I feel like I could have eaten more veggies so I will add more next time! Yum! I love everything but the avocado, an you give me a replacement because I can’t stand the texture of the avocado. I’d also like to add mushrooms because I love them. You can leave the avocado out. I haven’t tried it with mushrooms, but if you like them give them a try! I made this tonight and it was so good! I will be making this all summer long. It was so satisfying, too. It was s big hit. This was delicious! Corn isn’t quite ready here, so I sliced a vidalia onion and grilled it along with the veggies. Great seasonings for the shrimp-not overpowering at all. Will be a regular on our rotation! Thanks for sharing! I made this dish last night and it was fantastic. The shrimp had so much flavor. I added a yellow squash since I had one. My husband knew it was healthy but didn’t even realize it was lower calorie. Thank you! What could you substitute the corn with, to make it low carb? You could serve everything over lettuce(grilled or cold!) and leave out corn- or double the zucchini…. Or grilled eggplant! Do you think I could switch out shrimp for scallops? I have a bag in my freezer.